I shared my WordCamp Kathmandu 2018 experience in my last post. And today, I will be sharing my experience at WordPress Pokhara March Seminar 2018. So, starting off my journey to Pokhara on March 19th, I left my home at around 5 A.M. to avoid the heavy traffic. I picked up a few of my colleagues – Utsav Singh Rathour, Yam B. Chhetri, Surendra Shrestha, and Emanuel Blagonic – and headed towards Pokhara. Luckily, as we had started our journey early in the morning, we didn’t have to face a lot of traffic. For the breakfast, we stopped at Hamlet Restaurant in Dhading. Then, on our way to Pokhara, we took a short break to have coffee and continued our journey. We reached Pokhara at around 11 in the morning. Upon reaching Pokhara, we went for lunch in Dunga Restro & Lounge Bar at Lakeside, Pokhara. The restaurant had an excellent interior design and the lake view from the restaurant was just mesmerizing. We checked in to Hotel Meera, at Lakeside, Pokhara. After inquiring at Hotel Meera, we came to know that there was a different price charge for Nepalis and foreigners. It took us by surprise as I didn’t know about that. However, since we often stay at Hotel Meera whenever we visit Pokhara, I convinced the manager of the hotel to not differentiate in the charges. Later that day, Mayuko Moriyama also joined us and we went to Busy Bee Café for our dinner. Next day was the ‘WordPress Pokhara March Seminar 2018’ day—the main purpose of my visit to Pokhara. I must say, the event was very well-organized. Even though it was a seminar, it somewhat resembled a mini WordCamp. There were registration desks, speaking sessions, national and international speakers, and more. WordPress Pokhara March Seminar 2018 was very well-prepared—there were good event hosts, good line of speakers, and very few minor glitches. The event also had a felicitation ceremony for all the attendees as well. It was quite an unusual experience for me, as we don’t usually have a felicitation ceremony here in Kathmandu. We were honored with flower garlands and I was very surprised to see all the honoring programs. Most of the attendees at the event were students and freshers. Even the entrepreneurs present at the event were just kicking-off their business life. I must include this in my post today that WordPress Pokhara March Seminar 2018 reminded me of the very first WordCamp we had, back in 2012. Both of the events were quite similar to one another. I was in the panel discussion during the event and it went very well. I tried to be a little more interactive with the audience. There were many questions asked by the attendees and we happily answered each one of them. Most questions were based on the WordPress community and entrepreneurship. We, of course, were delighted to see so many people showing the level of enthusiasm in WordPress. I attended all the sessions held at WordPress Pokhara Seminar. However, I was not able to attend Emanuel’s session. He did a two-hour long session, which I think is commendable; not everyone can run a session that long. People were quite impressed with his talk as well. Later in that event, certificates were handed out to everyone; including the attendees. The organizers of the event also gave away NPR. 100 in Khalti to each one of them. I think it motivated the students to be a part of the coming meetups as well. 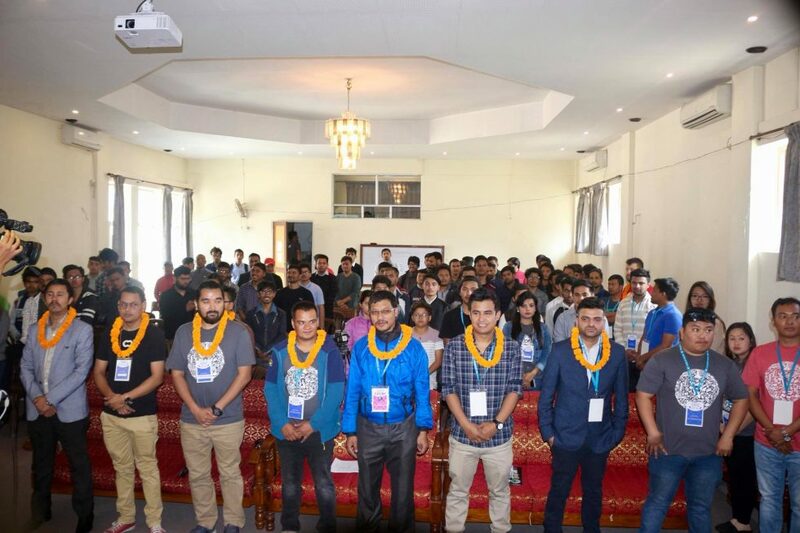 By attending the WordPress Pokhara March Seminar 2018 and seeing everything so well-managed, I believe the Pokhara WordPress Community will surely be able to organize a happening WordCamp this year. And we could distinctly monitor the enormous potential of the attendees there in Pokhara as well. Even Mayaku and Emanuel was very positive about the WordPress Pokhara Community. Apart from the seminar, we also visited some of the famous places in Pokhara—Begnas Lake, Fewa Lake, Barahi Temple and more. And to be able to show my foreigner friends the beauty of Pokhara, added icing on the cake even further. While coming back to Kathmandu on 21st March from Pokhara, Mayaku also joined us and it was again a very fun journey returning back to town. Here is a glimpse of my entire tour to Pokhara for WordPress Seminar. Enjoy! So, this has been a very good experience on my behalf and I am quite sure the rest of my colleagues enjoyed the event as well. I am very impressed with the team of WordPress Pokhara and I am looking forward to the announcement of WordCamp Pokhara 2018. This entry was posted in Events, WordPress by sakinshrestha. Bookmark the permalink.